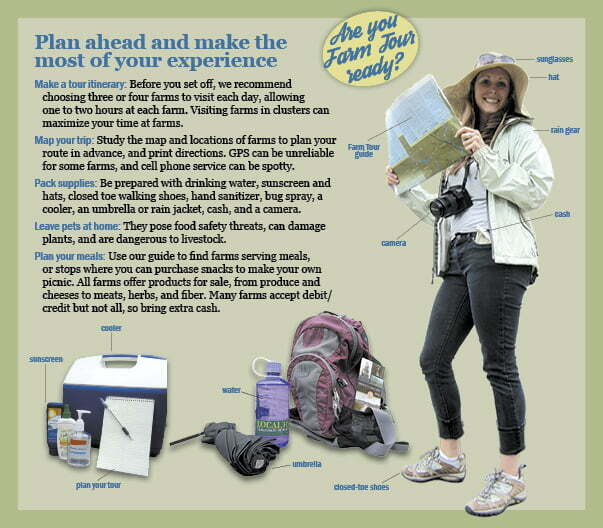 1) Make a tour itinerary: Before you set off, read the farm descriptions in the tour guide or online. We recommend picking three or four farms to visit per tour day, allowing one to two hours at each farm. 2) Map your trip: Study the map and locations of the farms, do your route planning in advance, and always have a map or printed directions on hand. GPS can be unreliable for some farms, and phone service can be spotty in the country. 3) Pack supplies: Be prepared with bottled water, sunscreen or a hat, walking shoes, hand sanitizer, bug spray, maps, a cooler, an umbrella or rain jacket, cash, and a camera. Not every farm will accept credit/debit for farm purchases. 4) Plan your snack breaks or meal stops: Bring a cooler and cash to enjoy meals and snacks on the tour and to take home farm-fresh products. Most farms have seating areas or picnic spots for you to enjoy a leisurely snack or meal break. All farms will offer products for sale, from produce and cheeses to meats and fiber. Several farms also offer meals and will be identified with an “Enjoy a Meal” description in their farm listing. 5) Leave pets at home: Pets are not permitted on the Farm Tour. Pets pose food safety threats, can damage plants, and are dangerous around livestock. 6) Wash your hands: Many farms will have hand-washing facilities, and ASAP will provide hand sanitizer at all farms as well. We ask that you wash your hands after petting animals and between farms to keep yourself and the farms safe. 7) Supervise your children closely: Animals, electric fences, and farm equipment can pose dangers to children. Keeping a close eye on your children will ensure that they stay safe.